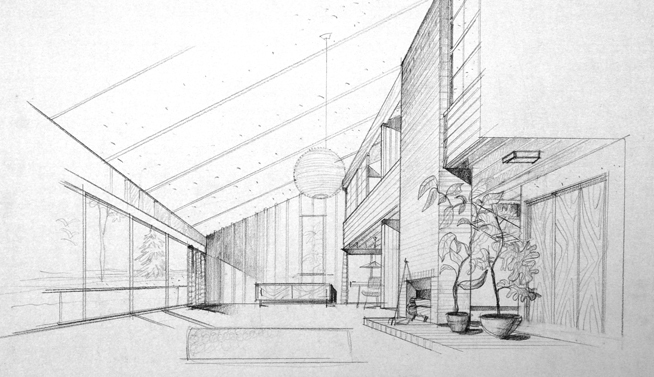 Historic New England recently acquired a collection of drawings by architect Stanley Myers of Newton, Massachusetts. Visit the Boston Society of Architects’ BSA Space to see highlights from the collection in a new exhibition, Stanley Myers: A Modernist Architect. The exhibition opens with a public reception on Thursday, June 26, from 5:00 to 7:00 p.m.
Myers (1923-2010), a graduate of Harvard College and Harvard Graduate School of Design, designed many homes and commercial buildings in and around Boston, as well as elsewhere in New England, Nigeria, and Ireland. His widow, Hanni Myers, donated the collection to Historic New England’s Library and Archives. Stanley Myers: A Modernist Architect, which also includes objects from Hanni Myers’ collection, is organized by Historic New England with the Museum of Fine Arts, Boston, and the generous support of Jean S. and Frederic A. Sharf.